I decided to ride my custom-built Waterford All-rounder. I had it built after my orange Bridgestone XO-1 was destroyed when the roof on my old garage collapsed. Needless to say the Waterford is an upgrade over the Bridgestone. The rain held off the entire way to the cottage. 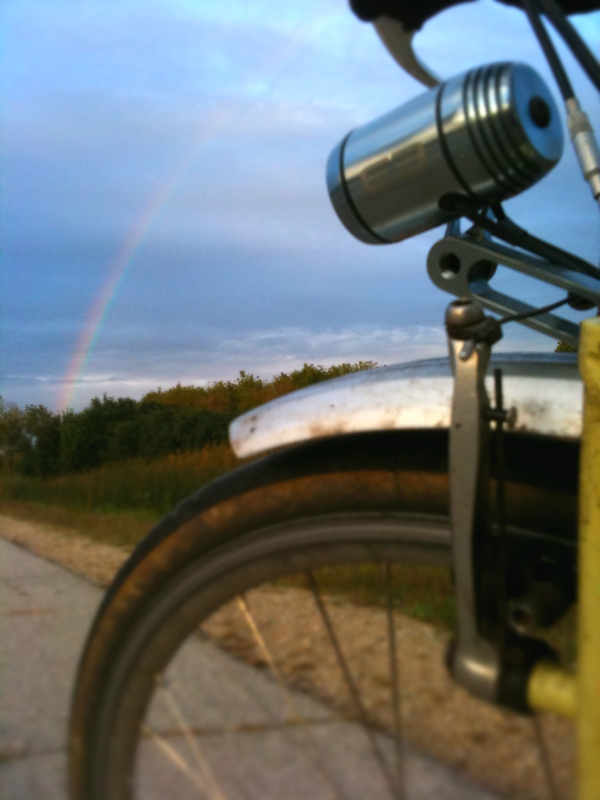 I rode toward the pot of gold, but never found it. Last Sunday my father-in-law asked me to help take the pier out at his cottage on Lake Tichigan. He is very generous and lets us go out there whenever we want, so the least I can do is help with the pier. It was also an excuse to get in a longish ride on country roads, something I don’t do enough of these days. It is about 30 miles to the cottage from my house, and I have developed a handful of very nice routes that I take depending on my mood. The forecast was for scattered rain showers, so I opted to wear an old Velo Trocadero kit I have. Knickers, long sleeves and a Swrve “Milwaukee Hoodie” in case the skies opened up. I picked it up a couple of weeks ago from Vince at Ben’s Cycle. This was my first test of the Milwaukee Hoodie. It got its name because Milwaukee Courier extraordinaire Kevin Sparrow helped design it. The soft-shell fabric, large hood and pit zips in Jame Dean red make it practical and messenger chic. On the way home from the cottage, it did start pouring out. The hoodie kept me dry and cool. I have a couple other soft shell coats, but I think the Swrve hoodie provides the best combination of water repellancy and breathability of any of the bunch. FYI, these are just iPhone photos. That is not a shadow, it is actually a reflection. 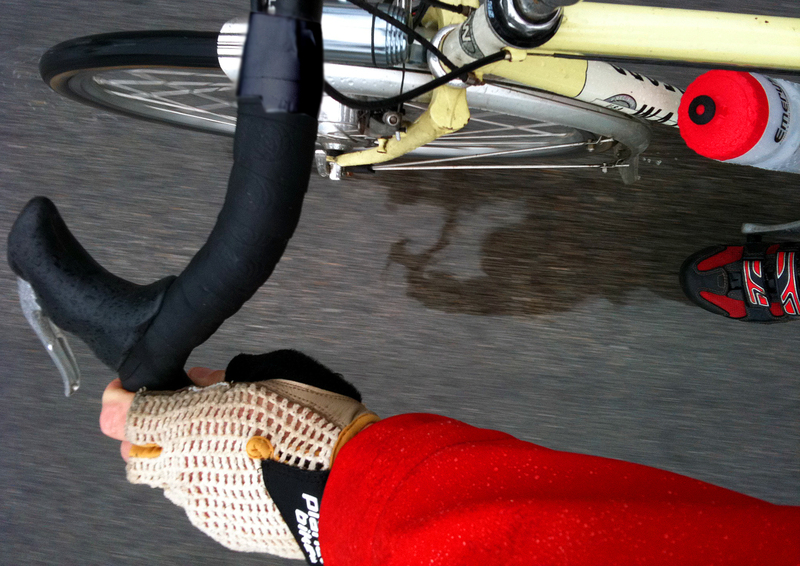 It was raining pretty good for most of my 30 mile ride home. You can see the water beading up on the sleeve of the Milwaukee Hoodie. Props to the good folks at Swrve for making a quality product that works on the bike and off. The Waterford is super beat and really needs a freshing up. I have considered getting it repainted in orange, which is still my favorite color, but I just don’t think I can let go of the old Jaguar color. I’d take the XO back again though.